Esa-Pekka Salonen’s restless innovation drives him constantly to reposition classical music in the 21st century. He is currently the Principal Conductor and Artistic Advisor for London’s Philharmonia Orchestra and the Conductor Laureate for the Los Angeles Philharmonic, where he was Music Director from 1992 until 2009. This is his final of three seasons as the Marie-Josée Kravis Composer-in-Residence at the New York Philharmonic and his second of five as Artist in Association at the Finnish National Opera and Ballet, where he will conduct his first full Ring cycle in future seasons. Additionally, Salonen is Artistic Director and cofounder of the annual Baltic Sea Festival, now in its fifteenth year, which invites celebrated artists to promote unity and ecological awareness among the countries around the Baltic Sea. He serves as an advisor to the Sync Project, a global initiative to harness the power of music for human health. The Barbican Centre in London has a season-long focus on Salonen’s music, including performances of LA Variations for orchestra; Dichotomie for piano; Two Songs from Kalender Röd for chorus; Dona Nobis Pacem for female chorus; Iri da iri for chorus; Gambit for orchestra; Wing on Wing, written for the Los Angeles Philharmonic's inaugural season at the Frank Gehry-designed Walt Disney Concert Hall and including recordings of Southern California’s plainfin midshipman fish and distorted samples of Mr. Gehry’s voice; Mimo II for oboe; the UK premiere of Karawane for orchestra and chorus, which he wrote as the first-ever Creative Chair at the Tonhalle Orchestra Zurich; Concert etude for horn, and the European Premiere of a new work entitled Pollux for the Los Angeles Philharmonic. 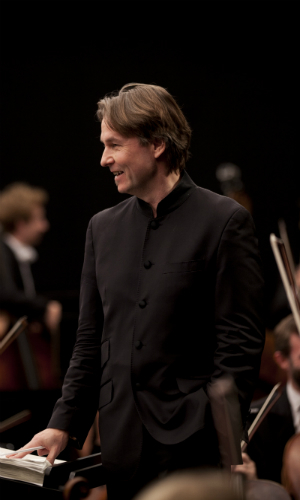 As he enters his tenth year as Principal Conductor and Artistic Advisor of the Philharmonia Orchestra, Esa-Pekka Salonen leads Mahler's third and ninth symphonies, a celebration of 100 years of Finnish independence, the European premiere of Unsuk Chin's Le Chant des Enfants des Etoiles, and Schoenberg's Gurrelieder. Salonen and the Philharmonia have experimented in groundbreaking ways to present music, with the first major virtual-reality production from a UK symphony orchestra; the award-winning RE-RITE and Universe of Sound installations, which have allowed people all over the world to conduct, play, and step inside the orchestra through audio and video projections, and the much-hailed app for iPad, The Orchestra, which allows the user unprecedented access to the internal workings of eight symphonic works. In 2015 he addressed the Apple Distinguished Educator conference on the uses of technology in music education. As the Music Director of the Los Angeles Philharmonic for seventeen years, Salonen is widely credited with revitalizing the organization. He was instrumental in helping the orchestra to open Walt Disney Concert Hall, presided over countless premieres of contemporary work, began the Esa-Pekka Salonen Commissions Fund, and made the orchestra one of the best attended and funded in the country. Salonen has an extensive and varied recording career. An album of Henri Dutilleux's Correspondances, recorded with the Orchestre Philharmonique de Radio France in the presence of the composer, was released in 2013 by Deutsche Grammophon on the composer’s 97th birthday. Also that year, Sony completed a project that began with Salonen and the Los Angeles Philharmonic nearly 30 years ago: a two-disc set of the orchestral works of Lutosławski, released in what would have been the composer’s 100th year. In 2012 he recorded a disc of Saariaho's La Passion de Simone with the Finnish Radio Symphony Orchestra and Dawn Upshaw. Deutsche Grammophon has also released a portrait CD of Salonen’s orchestral works performed by the Finnish Radio Symphony Orchestra and conducted by the composer, as well as a CD with Salonen's Piano Concerto and his works Helix and Dichotomie. The latter, with the Los Angeles Philharmonic and Yefim Bronfman, was nominated for a Grammy in 2009. A CD of five of his orchestral works is available on Sony. 2012 saw the release of his recording of Shostakovich's previously undiscovered opera prologue, Orango, with the Los Angeles Philharmonic. In 2009 a new collaboration with the Philharmonia Orchestra's partner label, Signum, was launched with the release of a live recording of Schoenberg's Gurrelieder; other recent recordings with the Philharmonia on Signum include Berlioz's Symphonie Fantastique and Mahler's sixth and ninth symphonies. Salonen's 2008 recording of Schoenberg's Violin Concerto and Sibelius' Violin Concerto with Hilary Hahn and the Swedish Radio Symphony Orchestra won a Grammy Award. Other recordings include a DVD of Kaija Saariaho's opera L'Amour de loin, with the Finnish National Opera, as well as two CDs with Hélène Grimaud, featuring works by Pärt and Schumann. The first CD recorded at Walt Disney Concert Hall, Salonen's recording of Stravinsky's Rite of Spring with the Los Angeles Philharmonic, was nominated for a Grammy in 2007.